Bankruptcy will dramatically alter Detroit's future. Yet, Michigan’s governor seeks it without consulting the voters. The city survived, and remains home to 700,000 Americans and the symbolic center of the nation’s auto industry. But after decades of neglect by federal and state officials, and a meltdown of American manufacturing, Detroit is facing exceptionally hard economic times. Detroit is up against plenty of threats. But the most pressing political threat over the past several months has come from a Republican governor who seeks to impose his will on a city that did not choose him or his austerity agenda. On Thursday afternoon, Michigan Governor Rick Snyder made his move. And the notion that the people who live in America’s great cities must govern their own affairs took a huge hit. On Thursday afternoon, Snyder signed off on the filing of paperwork seeking Chapter 9 bankruptcy protection in the US Bankruptcy Court for the Eastern District of Michigan. On Friday, a Michigan judge ordered Snyder's emergency manager to withdraw the federal bankruptcy petition. Ingham County Circuit Court Judge Rosemarie Aquilina's order declared the 2012 Michigan law that allowed Snyder to approve the city's bankruptcy filing violated the state Constitution. Michigan's Republican attorney general immediately announced that he would appeal the ruling, and analysts warned that federal bankruptcy law often trumps state protections. The legal wrangling will go on for months, perhaps years. If the bankruptcy court eventually accepts the argument presented by Snyder and his emergency manager, Detroit will become the largest American city to enter bankruptcy. It will, as well, be the largest American city in the recent history of the republic to take such a dramatic step without following the basic practices and procedures of democratic governance. Detroit’s economic challenges are not unique. What is distinct about Detroit is the denial of democracy. No matter how tough things get, most American cities face their challenges under the direction of local officials who take their cues from voters. When officials fail to act, or act inappropriately, they are replaced by the ballot. Sometimes, in emergency situations, they are recalled and removed from office in order to make way for necessary changes. But the voters still call the shots. That’s how it is supposed to be in America. There is an understanding at the federal level of American governance that the people who make essential decisions about federal policy should be elected. There is an understanding at the state level of American governance that the people who make essential decisions about state policy should be elected. In most of the country, there is an understanding at the municipal level of American governance that the people who make essential decisions about municipal policy should be elected. Under the authority that Snyder took upon himself to disempower local elected officials and replace them with his appointees, the governor and his “managers” are making the essential decisions. In Detroit, Snyder has pursued a bankruptcy designation that city officials, residents and representatives of current and retired public employees sought to avoid. And he used a concocted law that a judge has now rejected as unconstitutional. The emergency manager, Washington, DC, bankruptcy lawyer Kevyn Orr, sought to develop a restructuring plan. But unions representing city workers and retirees objected that he did not make a serious effort to consult with stakeholders. “Governor Snyder’s plan to suspend democracy, drive one of America’s largest cities into bankruptcy and deprive workers of their hard-earned retirement security, moved dangerously closer to reality today when without a single negotiation with unions, workers or retirees, Snyder authorized Detroit’s financial manager to file for bankruptcy,” said American Federation of State, County and Municipal Employees national president Lee Saunders. If the bankruptcy process initiated by the governor and his appointee were to go forward, critics of Snyder's move warn that Detroit could face austerity cuts on public services, policies established by the voters and their elected representatives could be rejected and contracts with unions representing municipal employees could be torn up. 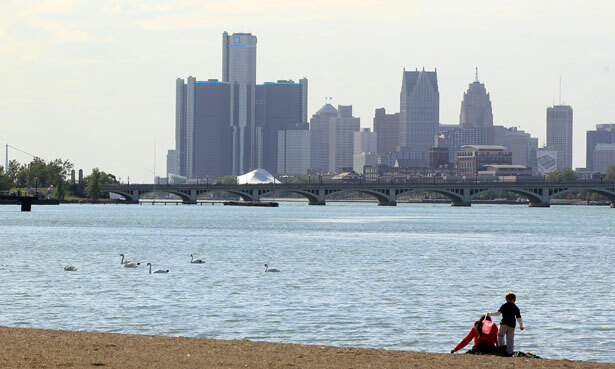 There is, as well, the real prospect of a widespread bartering of Detroit’s assets in a frenzy that could privatize waterfront recreation facilities and public utilities. That affront to democracy has been deeply felt, and much discussed in Detroit. In April, Cockrel announced that he would not seek a new term. Snyder has moved by fiat to do what he and his political allies could not do at the polls: take charge of local government in Michigan’s largest city. In the 2012 election, Democrat Barack Obama received 98 percent of the almost 300,000 votes cast in Detroit, while Republican Mitt Romney took just over 2 percent. No Republican contender for federal, state or local office won more than 6 percent of the vote in a city where African-Americans make up 83 percent of the population and Latinos account for roughly 7 percent. Yet now, a Republican governor is setting the city’s agenda as part of a statewide power grab. After Snyder’s takeover of Detroit’s affairs, it was estimated that almost 50 percent of Michigan’s African-American population resides in communities that are run not be local elected officials but by gubernatorial appointees. Detroit is not just Michigan’s largest city. It has, for more than a century, been one of America’s great urban centers. And the governor’s moves over the past several months have drawn national notice. Snyder says his takeover is necessary because—like many great industrial cities that have lost the factories that provided employment and tax revenues—Detroit’s finances are in rough shape. Everyone understands the challenges Detroit faces. Everyone understands that, as in other municipalities across the country, it is possible to point to some of Detroit’s past leaders and say that they made ill-thought and self-serving choices that undermined the city and its finances. And everyone understands that current officials have had a very hard time grappling with the issues that arise when a debt-burdened city’s tax base is disappearing. But what Snyder does not mention is that the state he runs has played a role in Detroit’s decline by withholding financial assistance that is due to the city. While the federal government has neglected the challenges faced by cities that are drowning in debt, Michigan government has refused to toss available lifelines. The Detroit News has noted the anger of the city’s elected representatives over the failure to provide more than $220 million in revenue-sharing payments. The money was supposed to be paid to the city after it capped income tax rates. Yet, even as Detroit’s economic circumstance worsened, Snyder refused to provide the needed assistance. Disputes between Michigan and Detroit over state aid are nothing new. But the state’s hard line has left the city vulnerable. And there’s plenty of grumbling in Detroit about the prospect that, as is so often the case in austerity moments, valuable public assets will be sold off at bargain-basement prices to private interests. All of this, from the appointment of the emergency manager to the bankruptcy filing to the austerity agency that is now increasingly likely to be implemented, will happen without the approval of the voters or their elected representatives. This is a fundamental issue. In tough times, under pressure from lenders and taxpayers, cities often make cuts. They even privatize services and sell off public facilities. But under Snyder’s emergency manager law, Detroit’s voters and their elected leaders aren’t making the choices that will determine Detroit's direction. A Republican governor, and his appointed manager, are calling the shots. That’s a basic American principle that Governor Snyder has abandoned with a power grab that should unsettle Democrats and Republicans, liberals and conservatives. What’s been happening in Detroit is not what democracy looks like. As Congress decides whether or not to resurrect the heart of the Voting Rights Act, Republicans in North Carolina are pushing a harsh new voter ID law.